WEIGHT RULES AND OPTIONS: The basic minimum weight limit for all-competing models will be 2300 pounds after race with driver. All weight will be required to be in block form of no less than 5 lb. Blocks, and no more than 50lb. Blocks, and securely bolted to the frame of the car with at least two 7/16� bolts or larger securing each weight. (WEIGHTS WILL NOT BE PERMITTED TO BE STACKED ON TOP OF EACH OTHER) WEIGHTS WILL NOT BE PERMITTED TO BE MOUNTED ON REAR BUMPER ANY WEIGHT THAT IS MOUNTED BEHIND THE FUEL CELL WILL BE REQUIRED TO BE MOUNTED UNDER THE FRAME RAIL. Added weight will not be permitted anywhere inside the driver's compartment or above interior of the car. No weight allowed on rear bumper or fuel cell brackets. ENGINE RULES AND OPTIONS: Only approved V-8 engines permitted. Aluminum blocks allowed but must have 75lbs mounted in front of bellhousing. Must also have the weight weighed prior to competing by Official. All engine combinations must run a 390-CFM Carburetor. No titanium connecting rods or crankshafts permitted. CYLINDER HEADS: Only eligible aluminum or cast iron cylinder heads permitted. Limit of 2 valves per cylinder. The centerline of the valves cannot be relocated in relation to the centerline of the cylinder heads and cylinder block. The General Motors SB2 engine will be eligible and may be used in any WRS event. CAMSHAFT: Roller camshafts and roller lifters will be permitted. Any steel or flat tappet lifter permitted. ENGINE LOCATION: Any competing model maximum engine set back of six (6) inches. TO BE MEASURED FROM THE CENTER OF THE FORWARD MOST SPARK PLUG HOLE TO THE CENTER OF THE UPPER BALL JOINTS. Maximum engine offset is 2 �" inches, to be measured from the center of the crankshaft to the center of the fixed ball joints. CLUTCH AND TRANSMISSION: High speed multiple disc clutches are permitted. All cars will be required to be equipped with an operable disengagement mechanism (Bert or Brinn type). Flywheel will be required to be equipped with a starter ring and car must have an operational starter. All transmissions will be required to have both forward and reverse gears in operable condition. Transmissions will be required to bolt to the rear of the bellhousing, which will be required to bolt to the rear of the engine. Five (5) speed or automatic transmissions will not be permitted. DRIVE SHAFT AND SAFETY HOOP: Drive shaft will be required to be in similar design to standard production original equipment type. STEEL OR ALUMINUM PERMITTED. All drive shafts will be required to be painted white. All cars will be required to be equipped with a hoop around the drive shaft. CARBURETOR, AIR CLEANER, IGNITION SYSTEM, ELECTRICAL SYSTEM: Any approved carburetor may be used. Approval of carburetor contingent upon meeting WRS technical inspection procedures. The carburetor approved for use is a 4150 series Holley 390 CFM carburetor, body # HP0-80507 will be permitted. The carburetor venturi must remain standard configuration as manufactured. Fuel injection will not be permitted. All cars will be required to be equipped with a round dry element type air cleaner, maximum height four (4) inches. Maximum diameter seventeen (17) inches. All air cleaners are required to have a complete metal top and bottom. No carburetor air dams or devices permitted to increase the airflow to the carburetor, either inside or outside of the air cleaner. Any approved ignition system permitted. NO CRANK TRIGGERED IGNITION SYSTEMS PERMITTED. No on board computers, automatic electronics, recording devices, of any kind permitted. Retard or ignition delay devices will not be permitted. INTAKE MANIFOLDS: Approved aluminum intake manifolds may not be extensively modified. The inside floor of the plenum and the carburetor-mounting flange must remain in the stock location as compared to the approved manifold with the same part #. Approved manufactures' identification in the form of cast -in part #'s must remain unaltered on the manifold. Carburetor mounting studs must remain in stock location. Any spacer added to the carburetor-mounting flange must not be welded to the manifold. The depth of the plenum cannot exceed a maximum of 6", measured from the gasket surface down to the floor inside the plenum of the manifold. Any maximum 2" four hole non-tapered or open carburetor spacer will be permitted as long as plenum depth does not exceed 6". FUEL CELL / GUARD: Commercially manufactured fuel cell required. Maximum size of 32 gallons will be permitted. Fuel cell will be required to be encased in a metal container. All fuel cells must be equipped with a rollover valve in the vent fitting and in the fuel fill. Fuel cells must be required to have pick up location on top of cell. It is highly recommended that all fuel cells be equipped with foam. Fuel cell will be required to be mounted to the frame of the car. Fuel cell will be required to be secured with straps or tubing around it. Fuel cell cannot hang below the bottom of the rear end tubes with the car setting at race height. All cars will be required to be equipped with a fuel cell guard that is mounted separately from the fuel cell and comes to the bottom of the fuel cell. Minimum 1 � �tubing must be used for fuel cell guard. Fuel cell must be mounted behind the driver's compartment and must have a firewall between the fuel cell and the driver. Electric fuel pumps will not be permitted. FUEL: Fuel must be gasoline only. The gasoline shall not be blended with alcohols, ethers or other oxygenates and it shall not be blended with aniline or its derivatives, nitrous compounds or other nitrogen containing compounds. No icing or cooling of the fuel system is permitted, in the pits or racing area. REAR AXLES, REAR-END COOLERS, AND REAR TREAD WIDTH: Quick-change rear ends with spur gears are permitted. Rear end coolers are permitted, but must not be mounted inside of the driver's compartment. THE REAR TREAD WIDTH CAN BE NO WIDER THAN THE FRONT WIDTH ON EITHER SIDE OF THE CAR AND IS SUBJECT TO APPROVAL BY OFFICIALS. EXTENSIVE TRACK WIDTH NOT PERMITTED. CAMBERED REAR- ENDS WILL NOT BE PERMITTED. No open tube rear-ends permitted. BRAKES AND SUSPENSION: All cars will be required to be equipped with four (4) wheel operational brakes. Brake rotors will be required to be made of cast iron or cast steel; calipers may be made of steel or aluminum. CARBON FIBER OR CERAMIC BRAKES WILL NOT BE PERMITTED. Center steering will not be permitted. Straight front axles will not be permitted. Front suspension must be of A-frame type. Shocks and spring will be required to be securely mounted to the car frame. Hydraulic or mechanical weight jacks will not be permitted that are within reach of the driver while sitting in the driver's seat, or while car is in competition. WHEELS AND BEADLOCKS: Steel or aluminum wheels permitted Maximum wheel width 14". Beadlock permitted. Only foam wheel covers or beadlock / mud plug combinations will be permitted. No disk wheel covers of any kind permitted. BATTERIES AND MIRRORS: All cars will be required to be equipped with a battery. Battery will be required to be mounted in a secure manner. Battery will be required to be mounted in a safe and secure manner. Mirrors will not be permitted. SAFETY, SEAT BELTS, SEATS, HELMETS, AND WINDOW NETS: All seats must be made of aluminum or steel and approved by Officials. All seats will be required to be mounted to the frame or the roll cage of the car. All cars will be required to be equipped with a minimum 5-point harness. All belts will be required to be mounted to the frame of the car or to the roll cage. Helmets should be of full-face shield type and are subject to inspection. All cars will be required to use a full size window net in the driver's window at all times. Fire resistant shoes & gloves recommended, Fire proof divers suit required. TOW HOOKS AND EXHAUST: All cars will be required to be equipped with a tow hook (cable 3/8 minimum or chain) both front and rear Rule Will Be Enforced. Collector type headers are mandatory, and will be required to exit under the car and extend rearward to a point behind the bellhousing. Headers must exit under the car and parallel to the ground or may exit left side of car. All competing models will be required to use mufflers to meet maximum noise level of 98 DBA at 100 feet. 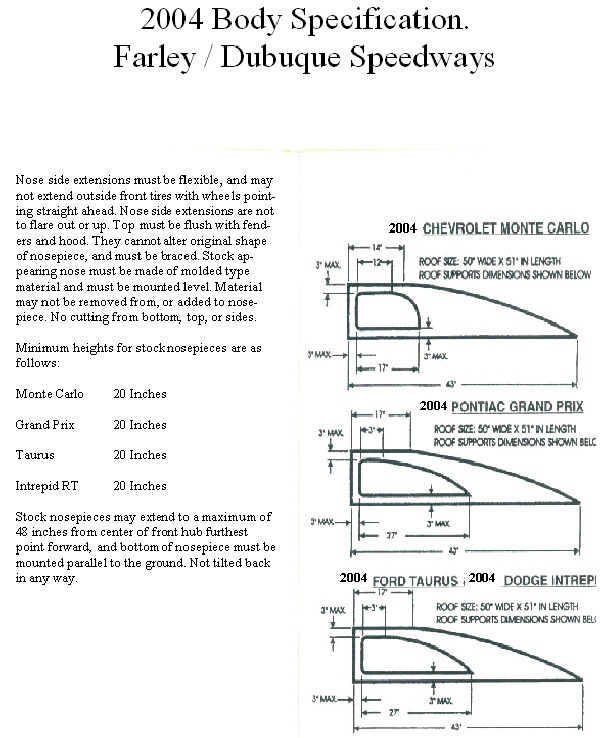 BODY, REAR SPOILER, ROOF, AND INTERIOR RULES: See diagram of rules sheet for body rules. Body will be required to be mounted in a professional and neat manner and is subject to approval by the officials. Window openings will be required to be wide enough so the driver can get out of either side of the car. One solid rear spoiler, maximum of eight 8" inches high and seventy-two 72" inches wide will be permitted. Maximum of (3) spoiler braces. Interior will be required to be made and installed in a professional and neat manner and is subject to inspection. The floor pan of the driver's compartment from the driver�s seat forward and up a minimum of 6" in front of driver's feet must be made of one sheet .125 thickness metal made of aluminum or steel. Two or more sheets put together are NOT acceptable. All cars will be required to have a firewall between driver and both the engine compartment and the fuel cell. Roofs may be made of fiberglass, steel or aluminum, but must meet specifications as set fourth in the rules and must be approved by track officials. All roof panels must have front mounting posts and rear roof panels. The rear roof posts must extend to the quarter panel, left and right side. The front roof posts must be a minimum of one 1" inch wide each. The rear roof panels must be mounted as per diagrams for the body style each car is using. Left and right side rear roof panels must be the same length and design. NO curving or bowing out of roof panels allowed. The interior of the car may be dropped a maximum of (3) inches below the top of the doors, but must fasten flush at the top of the doors and taper towards center of car without any lips. The interior may taper from the rear of the car down a maximum of (3) inches, but run parallel to the quarter panels for a minimum of (32) inches from the rear spoiler. RADIATORS, FANS, WATER PUMPS, OIL RESERVOIRS, AND OIL COOLERS: Only one (1) radiator will be permitted for the purpose of cooling water and will be required to be mounted in front of the engine. Oil reservoirs must be mounted in front of the rear-end housing. Oil reservoirs, oil coolers, or oil lines cannot be mounted inside of the driver's compartment. Electric water pumps will not be permitted. Water pump must be mounted in stock location for the make and model of engine being used. Water pump rotation must be the same as the crankshaft rotation. All cars must use a stock mounted fan blade that is mounted to the water pump. Electric fans will not be permitted. Clutch fans will not be permitted. WINDSHIELD SCREEN, ROLL CAGE, AND FRAME: All cars are required to have an adequate screen in front of the driver, with a frame and at least four (4) vertical bars. All cars are required to have an adequate roll cage with at least three (3) door bars in the driver's door. All cars must have a bar to reinforce the area around the driver's feet. All competing models must have a roof bar in the top of the roll cage and a vent window bar in the driver's door. TIRE RULES: Hoosier 11.0/ 88, 90, 92 - 15 Spec WRS stamped LSB Tire. No distinguishable lines may be cut or ground in the tires that resemble a sipe.
" THE RULES AND/OR REGULATIONS SET FOURTH HEREIN ARE DESIGNED TO PROVIDE FOR THE ORDERLY CONDUCT OF RACING EVENTS AND TO ESTABLISH MINIMUM ACCEPTABLE REQUIREMENTS FOR SUCH EVENTS. THESE RULES SHALL GOVERN THE CONDITION OF ALL RACING EVENTS, AND, BY PARTICIPATING IN THESE EVENTS, ALL RACING MEMBERS ARE DEEMED TO HAVE COMPLIED WITH THESE RULES. NO EXPRESSED OR IMPLIED WARRANTY OR SAFETY SHALL RESULT FROM THIS PUBLICATION OF, OR COMPLIANCE WITH THESE RULES AND/OR REGULATIONS. THEY ARE INTENDED AS A GUIDE FOR THE CONDUCT OF THE SPORT AND ARE IN NO WAY A GUARANTEE AGAINST INJURY OR DEATH TO PARTICIPANTS, SPECTATORS, OR OTHERS."